I swore to myself that I wasn’t going to write this post because I have seen a million of them on Pinterest. I actually got this idea from Pinterest. But this project has consumed all of my free time, and I haven’t been able to do anything else except for the decorations for my classroom. So here comes yet another post on the miracles of General Finishes Gel Stain. 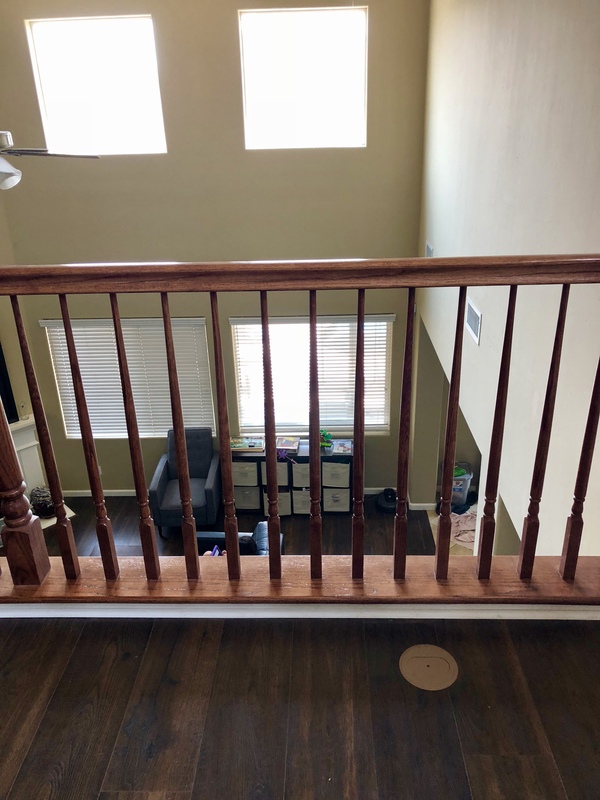 Refinishing the Bannister Costs How Much? A little more than a year ago we replaced the carpet in most of our downstairs and in our loft with a dark laminate. 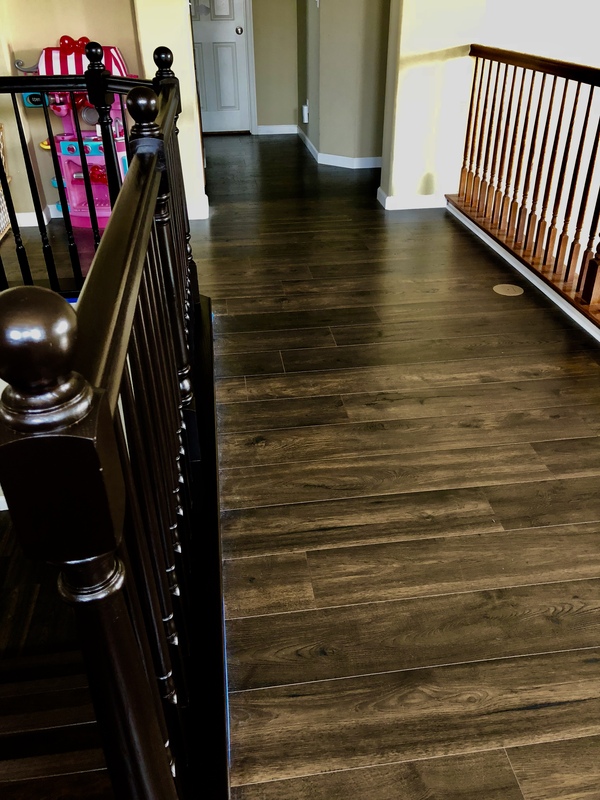 While this was a huge improvement over the old carpet it clashed horribly with the banister. Builder’s grade banister up against the new laminate. 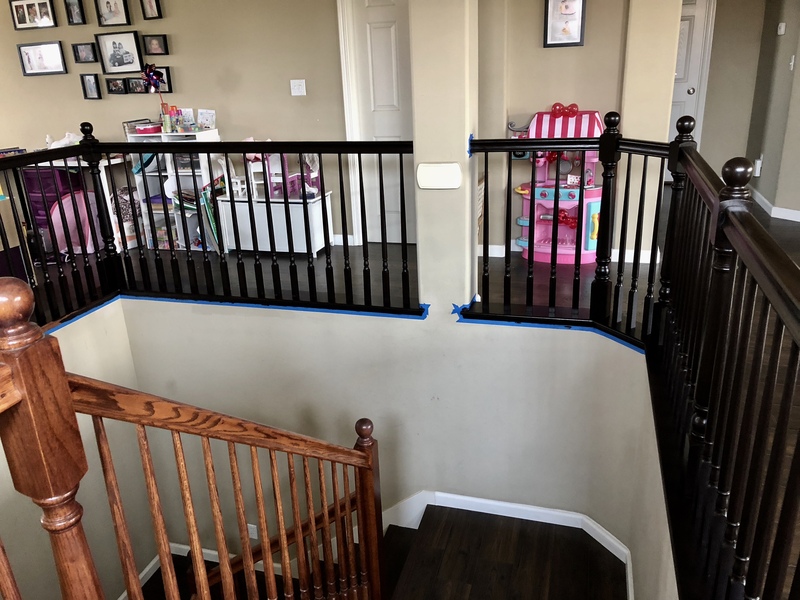 A few months after the installation of the flooring, I called a couple of painters to get quotes on restaining the banister. Each section of banister is three feet, and there are a total of 14 sections. The first painter that gave me an estimate advised I would not like how the finished product of restaining would look. He recommended painting the banister (something my husband was vehemently against) in order to achieve a more desirable outcome. This statement was followed by the disclaimer that the paint would not hold up well in areas where people put their hands. I assumed he meant the entire handrail along the stairs. He quoted me $4000.00 for the job. Now, he may have given this outrageous estimate because he really didn’t want to do the job (which having undertaken the job myself I totally get). The second bidder included our living room (you can see a glimpse of it in the above picture) with two-story high walls for $2500. This seemed a little too cheap, which brought the old adage ‘You get what you pay for’ to mind. Given those two options, I decided there must be something I could do myself. I certainly wasn’t the first person to update their flooring only to be stuck with an ugly banister. I consulted Pinterest, and as usual, it didn’t disappoint. I found a multitude of tutorials showing stunning banisters redone. All of the tutorials had one product in common, General Finished gel stain in Java. I am on my second quart-size can, and I am not quite done yet. The quart is around $34.00 on Amazon. My sister bought the gallon size for her kitchen cabinets and she said that was around $80.00. I am hoping this second can will finish the project. Disclaimer-I am not done with this project, but I feel I can definitely detail the beginning steps with confidence. I am working in 3-foot sections. 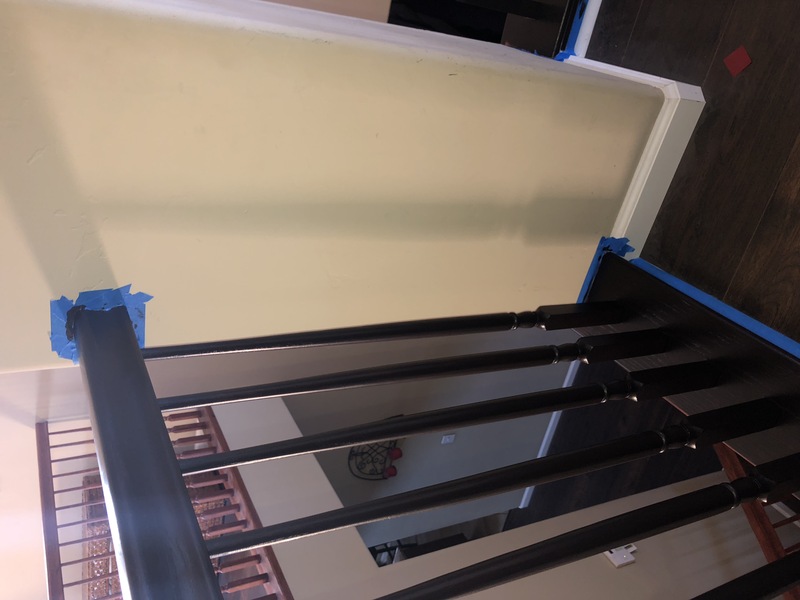 I started by taping off the wall where the handrail connects with the wall and between the molding and the floor. Painter’s tape protecting the wall and new baseboards. Over the years I have painted a lot of rooms, and my favorite tape to use is Scotch brand blue painter’s tape. I am cheap, so I have tried other brands in an effort to save money, but I have always gone back to Scotch. Save yourself some grief and pay the few cents more for Scotch. After taping off, I dusted with an old rag to make sure the section I was working with was clean and free of any lint or pet hair. I then used an old rag and wiped it down with the liquid sander. 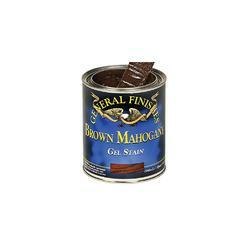 This breaks down the poly top coat on your existing stain and leaves the surface sticky. I then lightly sanded with the 180 grit sanding block to get the tacky residue off the wood. You definitely want to invest in a box of disposable gloves. We always have a huge box from Costco around. You don’t want the reusable kind like for washing dishes. Trust me, you are going to want to peel that glove off and throw right in the trash. Put your glove on and insert your hand into a clean old sock. You want an old sock that is well worn and won’t be losing lint in your stain. My husband has a ton of old black socks he was willing to donate to the cause, but it’s very hard to see where the stain is on a dark sock, so stick with white or a light colored sock. When the can is full I just dip my sock-covered hand directly into the can to get the stain. As I reached the bottom of the can it was easier to pour some stain into a Solo cup. Two coats of stain on the left and the original banister on the right. Before I started this project, I read numerous tutorials online about refinishing your banister. None of the ones I read, warned me about the problem I encountered. In a few sections, the first coat of stain never seemed to dry, it remained tacky after 48 hours of drying time. The top of the newel posts and the handrails sections that were heavily used just wouldn’t seem to dry. I had to sand these areas again to break that tacky surface and apply another coat of stain. I am clearly not a professional, my best guess regarding the cause of this problem is the oils from hands on these spots. My advice is to use extra liquid sander in these areas followed by a heavy sanding in these areas before applying your first coat of stain. Another before and after shot of the banisters. As I write this, I have about five sections left to stain. I still have to finish the hard-to-reach trim work. I hope to tackle applying the poly finish within the next couple of weeks. I will update the post to show the finished job and detail how to apply the poly coat.